Does anybody else confuse this guy with the Archbishop of Canterbury, or that just us? Think back to the first movie in which an actor found himself in the unenviable position of having to play a younger version of an iconic Harrison Ford character - Indiana Jones and the Last Crusade. In that movie, young Indy meets a man he patterns his whole life after. The same thing happens in Solo, though here it's less about the clothes and more about the entire personality. Tobias Beckett embodies exactly the kind of moral cynicism Han would only pretend to have; basically, young impressionable Han met this guy, identified with him, looked up to him, and started copying his mannerisms, right down to calling everyone "kid." The Han Solo we met in the first Star Wars was an affectation, the Christian Slater to this guy's Jack Nicholson. Under normal circumstances, Woody Harrelson is not an actor you'd expect to get an action figure - The Golden Girls may be getting Mego knockoffs from NECA, but Cheers doesn't even have POP!s and the Hunger Games lines never lasted long enough to get to Haymitch. The likeness on this toy is good, but it feels like the hair should be thinner - this is very thick and lustrous compared to the movie. Han Solo (ie, the fictional character that exists in our world) has always taken a lot of influence from Westerns, and Solo really plays that up, even going so far as to take a cue from Firefly by staging an outer space train robbery. So naturally, Tobias Beckett's outfit features a totally gunslinger-ish knee-length trenchcoat over his dark grey jumpsuit. In short, he's wearing Imperial officer gear, just sans the chest armor. 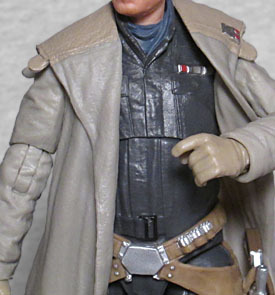 His coat is pulled back on the left, revealing one of the holsters on his gun belt, and if you pull it back farther, you can see the shiny insignia pins on his chest. The figure has all the usual Black Series articulation, but a lot of the joints on mine are remarkably stiff. The ankles, the elbows, the wrists... getting them to move is tough! Like any figure wearing a plastic coat, moving him too much will make the piece stick off his body in a weird, unconvincing manner, but the fact that it's not down to his ankles helps with that somewhat. 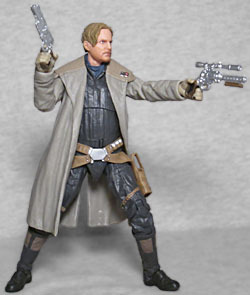 Also, because of the way his holsters are glued to his thighs, don't expect him to be doing any high kicks or anything. But for hustling around pointing his guns at things? He's fine. Hey, guns! He's got two of them! For his left hand, there's a BlasTech Sideloader DG-29 Heavy Blaster with an image-intensifying macroscope on the top, and for his right hand, a BlasTech RSKF-44 Heavy Blaster that should have some rainbow discoloration around the muzzle, but doesn't. 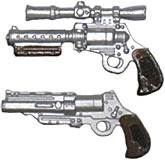 Both the guns look like revolvers, going back to the cowboy thing, and can fit in his holsters. The weirdest thing about Tobias Beckett is that he has a plain name and not some kind of space foolishness. How is he "Tobias Beckett" and not "Plimf Tawnstander" or "Gluupor Zaptros" or "Arbuster T. Bacontits" or whatever? You can probably find a "Tobias Beckett" in your local phonebook. 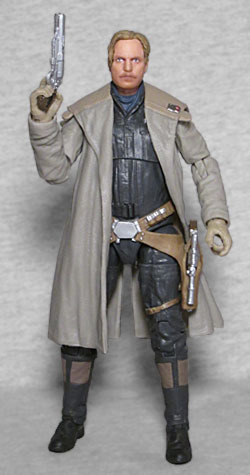 Some fans were disappointed the character wasn't Garris Shrike, Han's mentor character from the old books, but while the name may be different, the role is the same, and it means between this figure and Blade, we're just one Rosie Perez away from completing our White Men Can't Jump collection!